Trim your audio. You record more sound than you need. Now you must cut away the superfluous parts and, if necessary, make the sound loopable as well. Mix down your audio to mono. GIANTS Engine supports 3D stereo sound. However, the engine determines which speaker plays the sound, not the sound file. In fact, if the engine detects a stereo sound file, it automatically converts it to mono anyway. So it does you no good to have a file with stereo sound; it just wastes hard drive space. You can do both in nearly any audio-editing program. 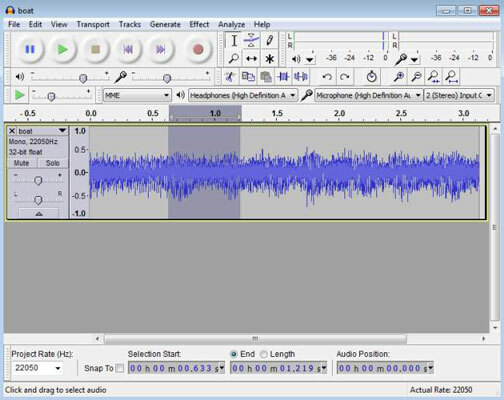 A popular choice is the free and open source sound editor, Audacity. You can download an installer for it from the Audacity website. After you install Audacity, start it and open one of your sound files. 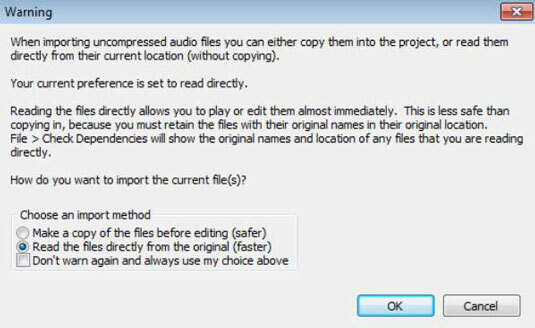 The first time you open a sound file in Audacity, you’ll get a warning dialog that gives you the choice between making a copy of your file before editing and reading your file directly. Audacity recommends the former as being a safer way to work. Use your own discretion and click OK after you make your choice. The Audacity interface isn’t overly complex. If you click and drag over your sound’s waveform, you can highlight parts of it, which is the main process you use for trimming away the extraneous parts of your sound file. Simply highlight the segment you wish to remove and then press Delete on your keyboard to remove it. When you remove a segment from the middle of a sound file, Audacity automatically shifts the remainder of the sound file left to fill the void. This is sometimes referred to as a ripple edit because your delete operation has an effect that ripples across the rest of the file. The other edit you may need to do is the conversion to mono, which is super easy. Just go to Tracks→Stereo Track to Mono in the menu. Audacity quickly handles the rest of the conversion for you.